A father and his son embrace after eventually being reunited. I have to give the Trump administration credit for one impressive achievement. They always manage, like world-class limbo dancers, to crawl under whatever bar of expectations I have set for them, no matter how low. Their immorality endows them with the endless ability to sink lower into the morass of malice, making concepts like “kindness” and “empathy”, to say nothing of “rationality,” seem positively quaint. Since the end of May, when the story of family separation and “zero tolerance” immigration policy broke nationally, I’ve spent much of my time following the news from our southwestern border. In a distressing change from the stances of previous administrations, the Trump administration declared that it would launch full criminal proceedings against every person who entered the U.S. without proper authorization and detain them for the duration of their cases. No “catch-and-release” and certainly no amnesty. 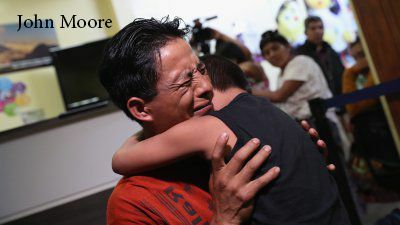 Even worse, families who crossed the border together were forcibly separated, and their children were scattered to unfamiliar detention facilities, housed with complete strangers in horrifying conditions. These places are not “summer camps,” as one desperate Immigration and Customs Enforcement official claimed. ICE agents abused a 6-year-old girl in a facility in Arizona, subsequently forcing her to sign a statement accepting that it was her responsibility to avoid potential threats. When doctors are actually allowed into detention facilities, they return with reports that the children are bearing respiratory diseases, infected with lice, and traumatized. Make no mistake: the blame for this inhumane horror lies at Trump’s feet, despite nonsensical attempts by the conservative fringes to pin responsibility on President Obama, who has been out of office for twenty months. “Zero tolerance” is Trump’s moral disaster. This whole presidency has been terrible — from Trump’s unnatural warmth with Russia and probable obstruction of justice in the case of election interference, to his moves to gut the EPA and the National Park system, to his assault on the free press — but, from a moral standpoint, this is the worst thing he’s done. The administration is even flouting constitutional checks and balances in order to perpetuate its policy. Hundreds of children remain separated from their families, more than a month after a court deadline to reunite them expired. Remember when we were at rock bottom? We’re straining our eyes to look up there now. If we cannot agree that abusing vulnerable children in this way is wrong, where is the soul of our nation?